On Tone 13 we Ascend to a Higher Consciousness. The Wind/IK trecena drew our awareness to our Power as Creators, holding the Breath of Life and Spirit. We were shown how we are Creators in our own right. Both our Lower and Higher Self hold this power to create our own experience of living. Only by bringing our Self into Oneness in Atonement with the Creator, are we able to fully experience the Happiness and Joy – the Creator’s Intention that every Human could live in Harmony and Equity. By drawing our attention to the Wind, we were able to discern the Voices of our Higher and Lower Self, so we could discern their value and potential, when they are working in Harmony. Jaguar/IX is a nahaul with the magical ability to shape-shift itself to travel to any time or place. As our two-sides were drawn together, we saw a new possibility for Divine Justice, not so far away in our future, but as potential in our every day lives. We saw that working in Unity, each day offers an opportunity for greater Happiness and Love. Through Divine Discernment, we can know that each day forward holds a Greater Potential for Harmony. Jaguar guides us to look into our own future. Today Jaguar/IX invites us to walk in its footsteps, engaging the Jaguar’s Magic of Gratitude. We already know that Manifesting ANY Creation is a process of drawing an Inspiration of Spirit onto the physical plane. To do that, we must first hold that image in Spirit, forming in detail the image of the Creation as if it were already real. Breathing Life and Spirit into our Intention, our Image of a Creation is given a life of its own. The Creation itself will guide us to the Discernment of making it so. On 13 Jaguar/IX we hold a New Wisdom, and new Sense of the Realness of our Power. We found the WAY to create our own Happiness through the Harmony of our Higher and Lower Self, operating as One with the Creator. The Wind/IK trecena taught us that both sides of our Self were given a Divine Purpose. And therefore, both sides of our Self deserve our Equal Acknowledgement and our Equal Love. Our Lower Self is the one we feel we must “fight against” to suppress the Voice of our Shadow. Yet, we learned that to be in right relationship with our Self, in fact, we must be willing to draw it out with Love. We are only afraid of an illusion when we think it’s real. With each new Truth we can see a new potential for our Dreams to come True. We see a clearer image of the Happiness we would create, through an experience of Peace and Harmony in the present moment. Today is an important day for a celebration. Just as we must first imagine every creation, so do we guarantee Higher Horizons ahead, by seeing our Self as Changed. Like learning to ride a bike, we can Acknowledge that our new Wisdom is something we won’t forget. A new Wisdom will become second nature in the discernment of every future experience. We could also look to our past, to see trials we may have stumbled through before, have been cleared for a new path ahead. Today is a major milestone that we would mark on the Road of our Destiny. We must discern what our milestone means to us. We must acknowledge what is different. We could start by considering our own perception of our Lower Self. Have we raised the degree to which we see it as undesirable? Has our own Polarity of extremes been drawn closer together, by a Higher Discernment of value? Were we able to see the potential for our Higher and Lower Self to actually work in harmony? Whatever small change we can Acknowledge as our Truth, is no less than a new Transformation of our Consciousness. We make one small change at a time. It’s our Human Nature to question. We don’t accept Truth without seeing it play out in our experience. We also know our Truth can change. We need more than one experience to evidence our Truth. The Holy Day of every trecena (Tone 8) holds the Intention of Divine Justice. This is the Creator’s Highest Intention for every Human. The Creator’s Intention for itself was to create a relationship through which to experience its Divine Self. The Creator imagined the experience of Harmony and Justice. The only way to experience Divine Justice, is through the transformation of Injustice. We could see the “rightness” and “divinity” of Every Experience as indispensable to the Discernment of Divine Justice. Like the Jaguar, we can travel to any point in time to see our Divine Destiny is to be witness to a dynamic process that would bear the Truth that every alarm, every illusion, and every fear holds an Intention for its Transformation to Harmony and Equity. May we give thanks for the Divine Seed of Love that was planted in our Hearts. And, remember the Divine Power of the spark within, to push beyond the darkness to be manifested in the Light. 13 is the number theurgy, the power to call the aide of Divine Agency to Human Affairs. May we make an Offering to Mother Earth, acknowledging her Constant Gift of Love. May we hold the hope for All Mankind to live in Harmony and Equity in her beauty. To all my relations, may we greet this day as a Sacred Event of Ascension to a New Truth that holds the power to change our future. May we see the Truth that Loving all of our Self is just as important as Loving every experience. May we acknowledge a new level of right relationship within our Self, and see our potential to reach a Higher Horizon ahead. May we see this as the major milestone of a new beginning, and the Truth that our future Transformation is started from Higher Ground. May we hold the Jaguar’s magic of gratitude. May we stop to recognize the beauty of Transformation that is shown to us by Mother Earth. May we see our Self as God’s Seed, planted on Mother Earth, that holds the inherent power and Divine Purpose to push beyond our own darkness, to be One in the Light. And, may we remember that through an Atonement of our Whole Self with the Creator, we share the Divine Power to transcend every Injustice to Create the Experience of Divine Justice. Jaguar/IX: Born with a deep love of the Mother Earth, Jaguar or shaman is directly tied to the source of all Earth magic. They possess great power of intellect and strength or character through integrity. Jaguar energy is feminine in nature and is the ruling spirit of jungles, plains, and mountains. 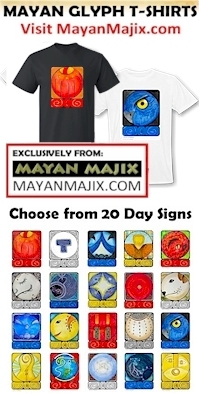 The spirit of Jaguar inhabits the Mayan temples and is called on to assist in spiritual as well as in material ways. Jaguar is also the god/goddess of gratefulness. Patience born of strength and skill can turn to pounce of quick decision and action. Both bold and stealth, Jaguars do not often attack directly and communications from them usually contain some mystery. In the absence of integrity, Jaguars power corrupts becoming a search for wealth and fame.